They host some of the world’s most exciting events and are often among the most massive structures in any given city – so why are stadiums themselves usually bland and boring? 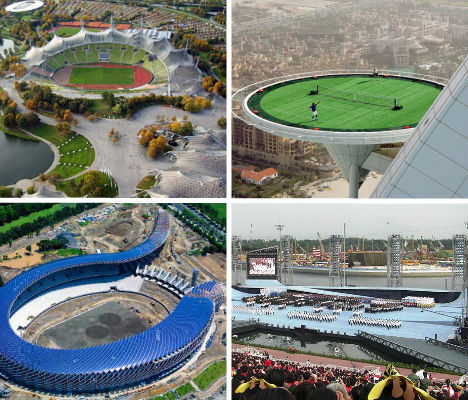 These 13 stadium designs shake things up with unexpected architectural details, surprising shapes and breathtaking surroundings from cliffs overlooking the city to helipads hovering hundreds of feet above the ground. From above, it looks alien, a massive metallic shell-like structure gleaming in the sunlight. 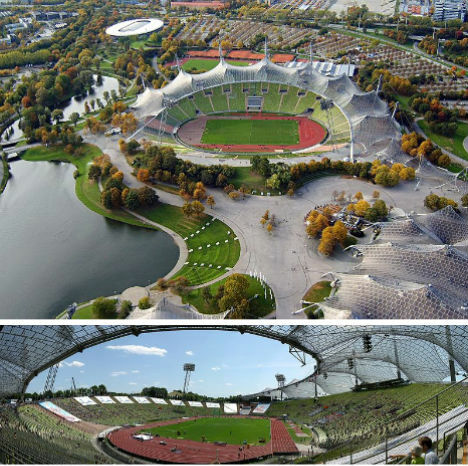 The stadium at Germany’s Munich Olympic Park is made from stainless steel and acrylic and is the only stadium in the world to have hosted the Olympics, the World Cup Final and the European soccer championships final. Sure, there are some baseball fans that are so obsessed with the sport that living in a stadium would be a dream come true. But what about an entire neighborhood? Built in 1950 for Japan’s Nankai Hawks baseball team, Osaka Stadium was an entirely ordinary sports venue for nearly forty years – until the team moved to a new stadium. 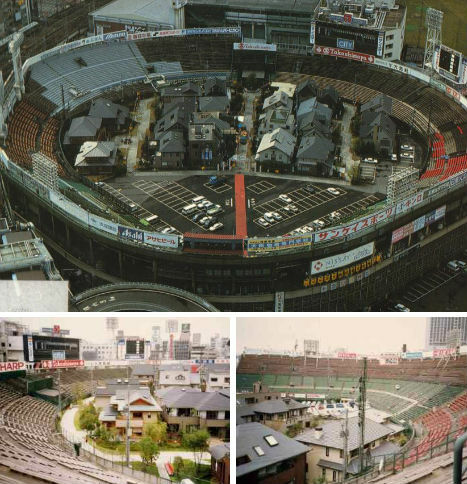 The abandoned Osaka Stadium was used to hold model housing for several years before it was demolished in 1998. The world’s largest floating stage can hold the weight of 9,000 people, 200 tons of stage props and three 300-ton military vehicles. And that’s just the platform itself; the adjacent stands hold 30,000 spectators. ‘The Float at Marina Bay’ is on the waters of the Marina Reservoir in Singapore and is used not just for sports but also concerts, exhibitions, art performances and the National Day Parade. At the Cocodrilos Sports Park in Caracas, Venezuela, you could be forgiven for getting distracted from the soccer match by the eye-catching architecture of the stadium itself. 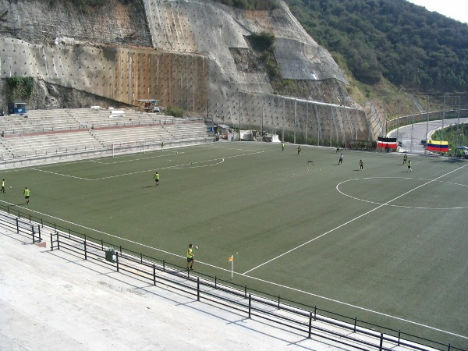 Situated next to a mountainside, the stadium is walled in with concrete plates that give it a highly unusual look. 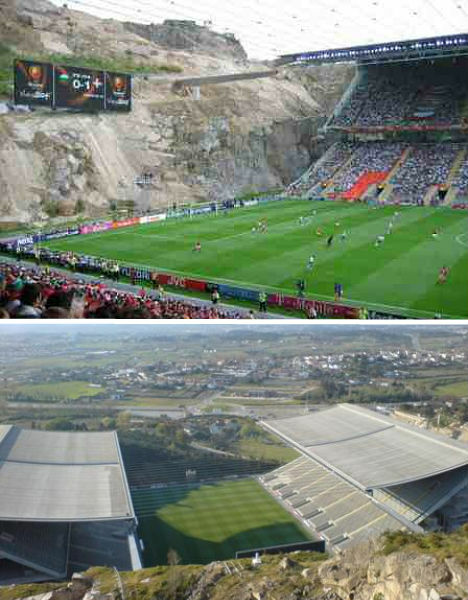 Even more beautiful is Portugal’s Braga stadium, carved into a granite quarry overlooking the city of Braga. At one end of the stadium is the dramatic rocky wall of the quarry and at the other end is an open vista of the city below. Braga is one of Europe’s most expensive stadiums, its price tag of €83.1 million coming mostly from the costly rock-moving process required to build it. 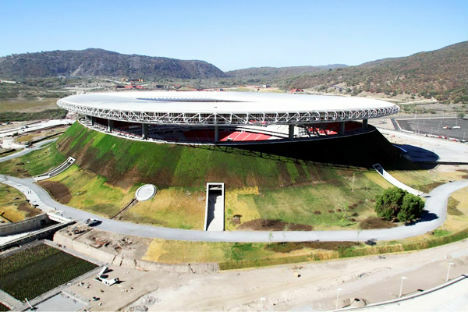 Like a ring of smoke from an erupting volcano, the white membrane of the Estadio Chivas stadium in Guadalajara, Mexico rises from a sloped opening in the ground. That’s no mistake – architects Jean Marie Massaud and Daniel Pouzet looked to the surrounding landscape for inspiration. Parking is hidden under the hill and when it’s not in use, the stadium itself is used as public recreation space. When it comes to sports stadiums, does it get any more picturesque than this? 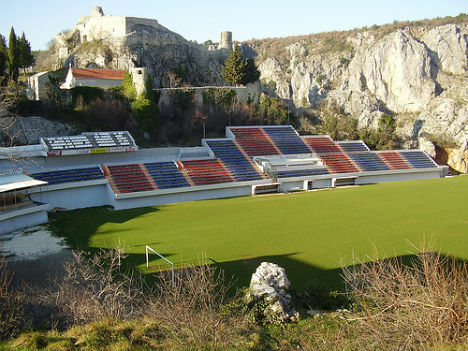 Gospic Dolac is home to the NK Imotski football club in Croatia and the 4,000 spectators that its bleachers hold get stunning views of nearby medieval ruins, the hillside and the Blue Lake. 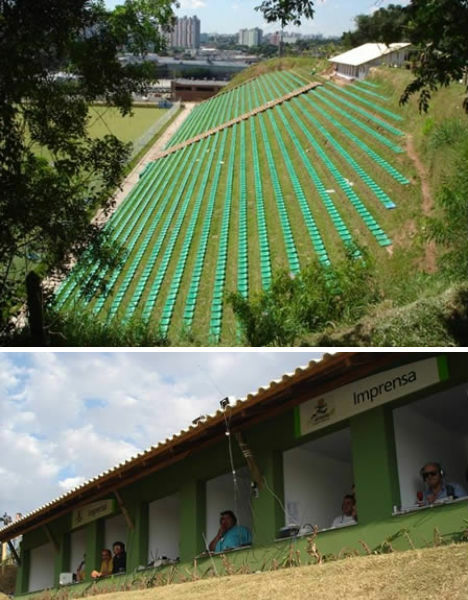 At Brazil’s first eco-friendly stadium, you won’t be sitting on hard metal bleachers, but rather seats embedded in the grassy hillside. All of the wood used in the stadium was reclaimed to prevent deforestation, and not a drop of concrete was used in the stadium’s construction. It was the iconic image of the 2008 Summer Olympics in Beijing – a stunning design that originated from the study of Chinese ceramics, and one that was unlike any other stadium in the world. 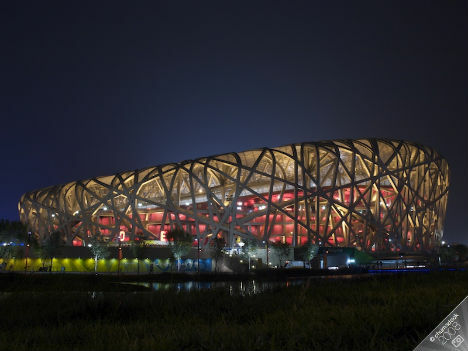 The Beijing National Stadium, or Bird’s Nest as it’s commonly known, has a distinctive asymmetrical design made with crisscrossed steel beams. 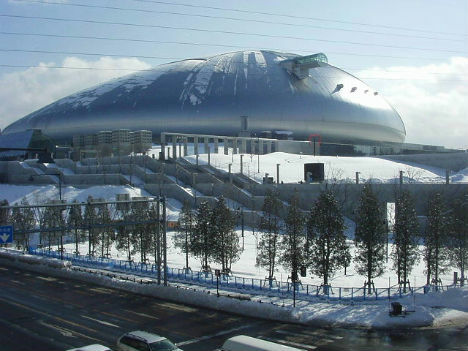 Sapporo, Japan gets so much snow every year that engineers faced a dilemma in designing a stadium for the city: how could they ensure that the grass playing field would get enough sunlight without using a retractable roof, which may not hold up to 20 feet of frozen precipitation? Their solution was 8,300-ton field that slides in and out of the flying saucer-like stadium, allowing it access to fresh air and sunlight on nice days. This moving field also enables the stadium to switch between baseball and soccer. 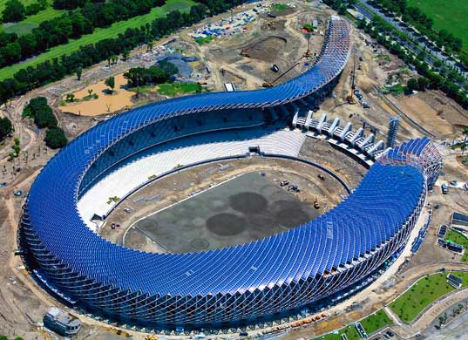 Like the scales of a reptile, 8,844 solar panels cover the new stadium in Taiwan. It’s a fitting facade for a dragon-shaped arena, which generates 100% of its own power and is located on a tract of undeveloped land that is also home to public green spaces and an ecological pond. 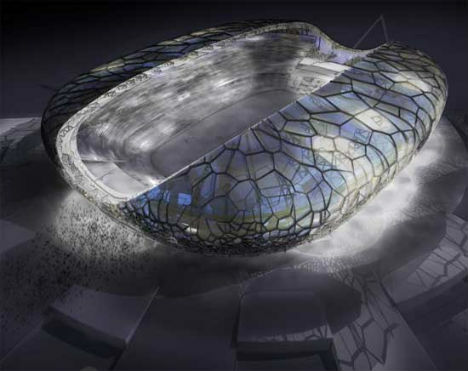 If all goes according to plan (and the economy doesn’t take yet another architectural victim), Russia will get an incredible new stadium for the 2014 Olympics. Sochi Olympic Stadium will feature a translucent, all-glass exterior inspired by both its coastal location and mountainous backdrop. Construction has not yet begun, but the stadium is due to be completed in 2012. When photos of a sky-high tennis match appeared online, many people assumed they were a hoax. It does look too bizarre to be true – not to mention unsafe – but the photos in question are in fact real. 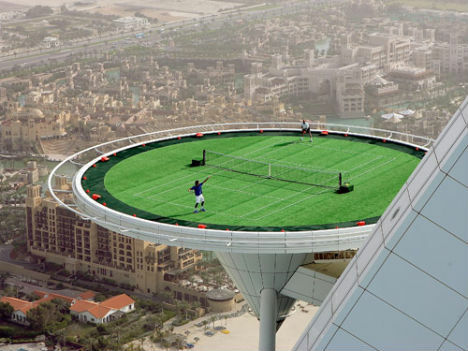 The Burj Al Arab skyscraper in Dubai converted its helipad to a tennis court and held a match between Roger Federer and Andre Agassi in preparation for the 2005 Dubai Championships.